Lübeck, founded in 1143, is renowned as the birthplace of marzipan and the beautiful Hanseatic City is a UNESCO World Heritage Site. Located on an island and completed surrounded by the Trave and Wakenitz Rivers, Lübeck is called the Venice of the Baltic. With towering Gothic churches, Medieval buildings set on serene squares and sweet marzipan, this northern German town shouldn’t be missed. Here’s what you should do with 24 hours in Lübeck. Get a birds eye view from St. Peter’s Church. The best introduction to Lübeck is getting a birds eye view of it from atop St. Peter’s Church. The church was originally built as a Roman church sometime between 1227 and 1250. It was expanded as a Gothic church in the 16th century. The roof was badly damaged in World War II bombings in 1942 and it wasn’t repaired until 1987. It’s no longer used as a church; it’s an exhibition space and event center. But be sure not to miss a visit to its viewing platform for sweeping views over Lübeck. There’s even an elevator, so you don’t have to climb any dizzying steps to reach the top. St. Peter’s viewing platform is open October – March from 10am – 7pm daily and April – September from 9am – 9pm daily. Admission is €3 per person or a family ticket for 2 adults and 2 children is €6 per person. Warm up with a marzipan cappuccino. There are a few tales about how marzipan came to exist, but the most popular is that around 1407 there was a famine in Lübeck and grain wasn’t available. There was, however, a lot of almond stock stored in the granaries and the Senate ordered the bakers to bake bread using it. There were once hundreds of marzipan producers (you can see them all on a map in the Marzipan Museum) and today several still exist producing Lübecker Marzipan. Café Niederegger was founded in 1806 and in the heart of the Hanseatic city, has become a secret symbol of Lübeck. Stop by their second floor cafe for a marzipan cappuccino and their famous marizpan nut cake. There is also a small marzipan museum that is sort of hidden, so ask where it is. You’ll be amazed by the 12 life-size people made of marzipan that include famous people ranging from Hans Jakob Christoffel von Grimmelshausen to Thomas Mann. They were all also fans of Lübecker Marzipan. You can pick up some souvenirs (or treats for later) in the first level shop. 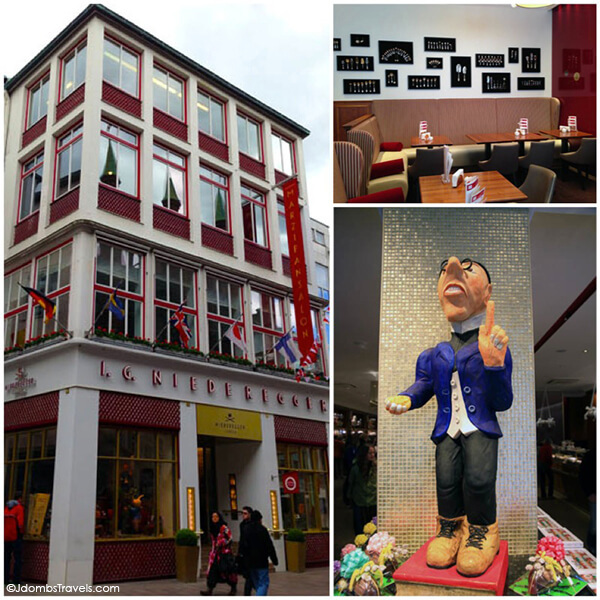 Café Niederegger is open Monday – Friday from 9am – 7pm, Saturday from 9am – 6pm, and Sunday from 10am – 6pm. 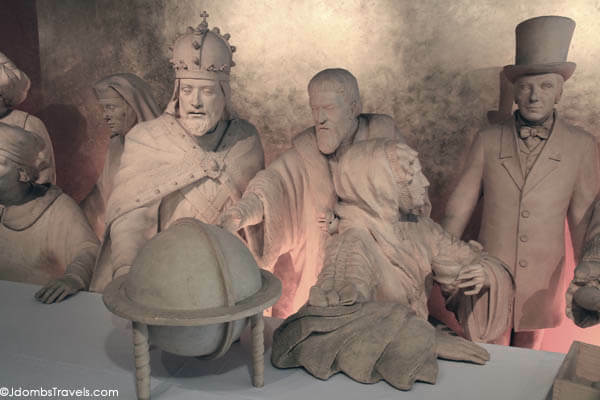 Admission to the marzipan museum is free. Have lunch at the Seafarer’s Guild. Said to be one of the most Medieval buildings in Lübeck, the Seafarer’s Guild is the town most traditional restaurant. The original building was aquired by the Seafarer’s Guild and taken down in 1535. A new building was built with a rising gable and still exists in its original form. It was once used as a convention center, but today is a restaurant. 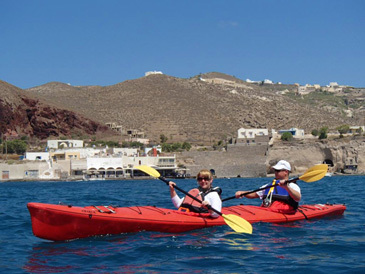 Though the Seafarer’s Guild still meet here and are active in the community even today. Not only is the atmosphere fantastic, with the model ships hanging from the ceiling and long wooden tables meant to be shared (and for eavesdropping on your fellow dining companions, if you speak German, that is), the food is equally so. Seasonal vegetables and fresh catches are available on the daily specials. If you order off the regular menu, I highly recommend the lamb stew with apricots and spaetzle. No matter what you order as the entree, don’t miss the apple strudel with marzipan for dessert. The Seafarer’s Guild is open 10am – 1am daily. 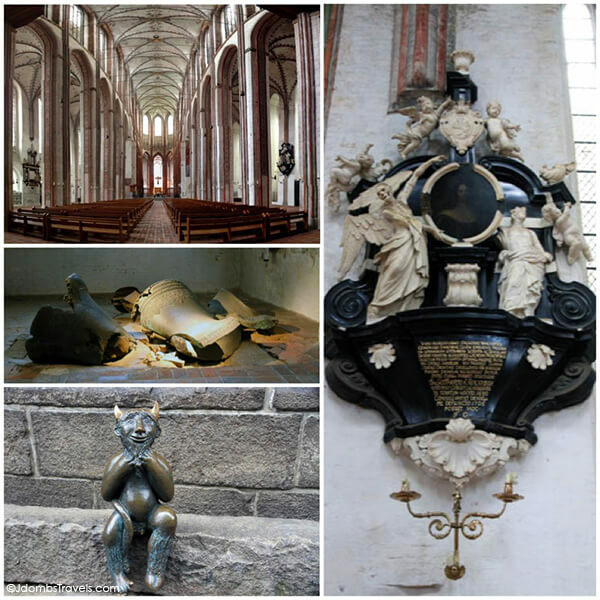 St. Mary’s, completed in 1350, is the third largest church in Germany and a grand example of Gothic brickwork. St. Mary’s was nearly burned down during the bomb raid on Lübeck in March 1942. The roof burnt out and the bells came crashing to the floor, piercing it in an upheaval of brick, where they have still been left today as a memorial. Luckily, the building was protected from further destruction even though the war was still going on. In 1968, St. Mary’s got the world’s largest organ with 10,000 organ pipes. The largest of the pipes are 11 meters tall and it was made by Kemper, a manufacturing firm from Lübeck. Take note of the devil statue outside St. Mary’s. When the first stones of St. Mary’s were laid, the devil believed the building was going to be a wine bar. He quite liked the idea; after all, after a few drinks in such a place souls often committed devilish acts. So the devil even started to help the worker to finish the building faster. Much to the devil’s chagrin, he one day realized what the building was meant to be and angrily hurled a huge bolder to smash the walls that were already standing. The workers panicked, but one shouted at him: “Stop Mr. Devil! Leave what has already been erected and we will also build a wine bar in the neighborhood for you!” The devil liked this idea and dropped the boulder right next to the church, where it still lays today. And there is indeed a wine bar directly across from St. Mary’s. Sip a glass of Lübecker Rotspon. Stop by one of the cafes or the wine bar to try a glass of Lübecker Rotspon, which dates back to the 13th century. It was at that time that the first ships of the Hanseatic League sailed to France and bought Bordeaux wine. Once brought back to Lübeck, it was allowed to mature in Lübeck’s wine cellars. During the French occupation, it was Napoleon’s officers that noticed that the Bordeaux wines aged in Lübeck tasted much better than the Bordeaux wines at home. It’s thought that the climate and temperature in Lübeck’s cellars had a better effect on the aging wine than in the cellars of Bordeaux. Our verdict? Lübecker Rotspon is a delicious wine and we’d only wished we had more room in our luggage to bring some back home. Tour the Lübeck Town Hall. The Lübeck Town Hall is said to be the most beautiful town hall in Germany and though we’ve only seen a handful of them, we have to agree. The three gabled houses were constructed on the marketplace in 1230 and then expanded over the centuries to include the Hanseatic Hall. Guided tours of the Town Hall are available Monday – Friday at 11 am, 12pm and 3pm and on Saturday and Sunday at 1:30pm. Wander the alleys of Old Town. The entire Lübeck Old Town is a UNESCO World Heritage Site and is one of the most famous relics of the brick-lined Gothic culture. This is truly old Lübeck where narrow angled alleys seems like a different world than the wide open Hüxstraße. Wander about them, especially around the area between St. Peter’s Church and the Holsten Gate. You might just come across some interesting museums like the Museum of Theater Puppets. One of the most famous sights of Lübeck, it’s likely to first catch your eye as you arrive in the Old Town from the train station. The Holsten Gate does stand as the entrance to the Old Town, after all, and served as a symbol of Lübeck being a free imperial city. Built between 1464 and 1478, the gate served as both a form of defense and as a form of prestige. It’s inscription declares CONCORDIA DOMI FORIS PAX, meaning unity at home and peace abroad. It’s hard not to notice that the tower leans at an odd angle because the South Tower sunk into the marshy ground. Be sure to pay a visit to the museum housed inside. It’s easy to miss as there is just a tiny door to the entrance. Here you can see historic ship models, suits of armour, and learn more of the historic about the Hanseatic Trade. The Holsten Gate Museum is open January – March on Tuesday – Sunday from 11am – 5pm and April – December daily from 10am – 6pm. Admission is €6 per person. International flights are available to Hamburg. Lübeck is a 40 minute train ride from Hamburg. Our UNESCO Natural Sites and Proud Cities trip was hosted by the German National Tourist Board in order to bring you this story. As always, all opinions about the places visited are entirely our own. I may be visiting Lubeck at some point for work, so I’ll definitely keep these tips in mind! I had no idea marzipan was invented there, so I definitely look forward to trying some of it when I get there! 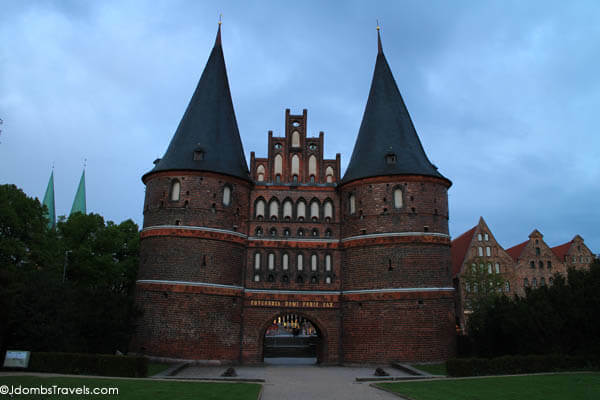 Lubeck will certainly be a lovely place to have a work trip to, Sam! Be sure to try to marzipan cappuccino. It was delicious and hardly needed any sugar. If you love marzipan, you’d love Lubeck Michael! The store is huge with plenty of options to take home as a gift (or maybe just for yourself) and the cafe is charming. We really loved the gabled houses, Freya. They’re really charming. Such a stark contrast from Berlin, which is only a few hours away and so modern. I really love your photographs. Medieval architecture is some of the most interesting to me. Yes, your photos are very nice. Great blog! Maybe visitors also like to visite the Günter Grass House. Where in Germany are you from, Stef? 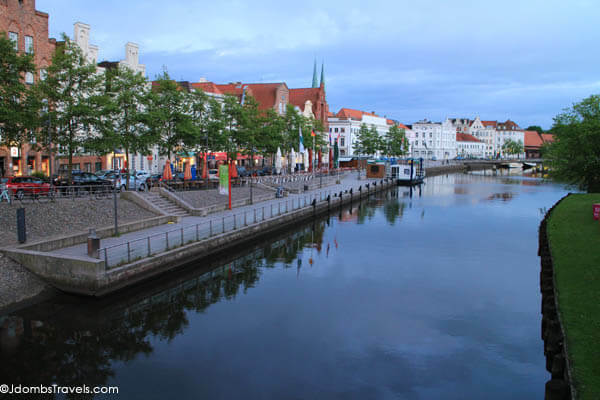 We were really pleasantly surprised at how much we liked all of the Hanseatic cities we visited on our trip. You’ve inspired me even more for our trip this summer to Luebeck. 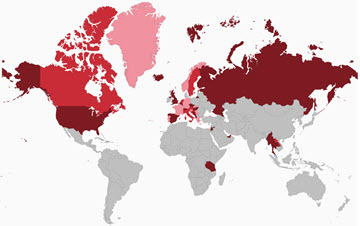 I was born in and have family in Saarland and I have never been to the north coasts. Great suggestions! Looking forward to the Nordsee fisch. 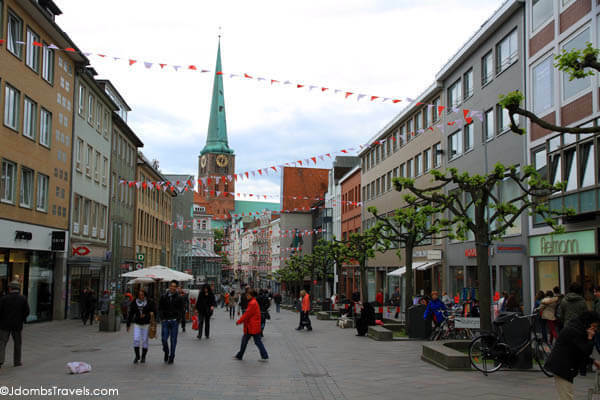 I visited Lübeck in September 2013 and it was amazing! I did not see everything mentioned in this article, but I wish I could have. I hope someday I can return. Great recommendations. I had only several hours to spend in Lubeck as a side trip from Hamburg, but made the most of it. Loved the hazelnut marzipan cake at Lübeck’s oldest café, Conditorei & Café Maret, and St. Mary’s Church is amazing. I was there during the Christmas markets which was a wonderful experience, too. If I ever go back to Germany, I’ll try and make a visit to Lubeck. I didn’t know much about what there was to do there until now, but I’ve always loved the architecture of the Holsten Gate. I can just picture myself taking so many photos of it! You had me at marzipan cappuccino 🙂 This looks like such a charming little town and I just might have to add it to my Germany itinerary! The marzipan cappuccino was so yummy! It didn’t even need any sugar to sweeten it. Thank you for a very detailed guide! I’m planning to go there later this month, via Kiel. Enjoy! Be sure to try a marzipan cappucino. They are delicious! Thank you for a very detailed guide! I’m planning to go there later this year.